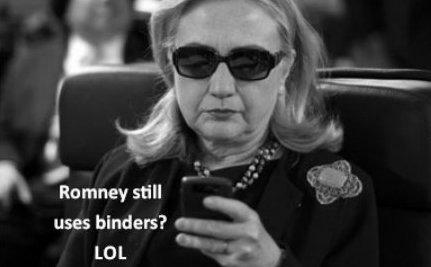 ‘Binders full of women’: What’s the social media buzz about? Christian Science Monitor BINDERS FULL OF WOMEN: Yes, it now has its own Twitter account, (at) Romneys_Binder, with more than 12,000 followers before the debate ended. On Facebook, it has nearly 20 different Facebook pages, including one with nearly 136,000 likes. “Binders Full of Women”: Romney on Pay Equity for Women – Town Hall Debate … New York Times Mitt Romney described how he brought women into his administration as governor of Massachusetts in answering a question about pay equity for women. Binders full of women? Milwaukee Journal Sentinel (blog) Thank you Mitt for that revealing’ “binders full of women” phrase. It was also a comedian’s dream. We were wondering the same thing pic. Binders Full of Women: A Meme That Means Something The Atlantic Romney’s turn of phrase wasn’t just a Tumblr waiting to be born, it was an insight into his views on the importance of promoting women. Song A Day’s ‘Binders Full Of Women’ Mitt Romney Edition (VIDEO) Huffington Post (satire) Jonathan Mann has been writing a song and making a video every day for the past 1385 days as part of his Song A Day project, and the October 16 edition was (of course) about Mitt Romney’s “binders full of women” comment during the presidential debate.